South-East PDP Press Conference In Enugu after their emergency meeting on Saturday the 13th October 2018. 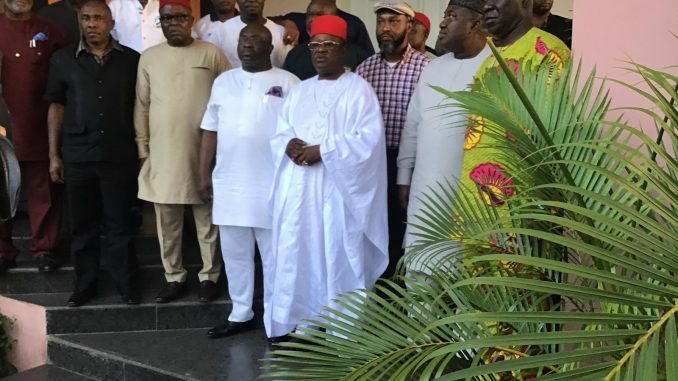 That the southeast PDP leaders acted shamefully and in a pedestrian manner when they went to press questioning the VP pick on grounds of alleged non-consultation instead of congratulating both Mr. Obi and Atiku. That most recently, having conceded that decision to Asiwaju Bola Tinubu, he single-handedly picked vice presidentYemi Osinbajo.